The Wesley International Academy Media Center is dedicated to literacy, research, and technology. Students at Wesley are continuously challenged and encouraged to reach higher levels of academic achievement while working closely with their teachers. To help students reach their academic goals, the Media Center offers resources and several subscription services accessible for students at school and home. Login to Destiny Quest to search our inventory, create a student login, make book lists, and more. Summer is a great time to read! 2018 will be our third summer of reading and we are striving for 100% participation. Summer Reading helps to keep students’ brains active during June and July. It also gives students a platform to bond with classmates on the first day of school. Everyone in the class will have read the same book and will be able to share and discuss their opinions. The books were chosen based on reading levels, curriculum, and/or social related content. We also made sure to choose books that would be enjoyable for the students. Below are links to the 2018 grade-level lists, accompanying assignments, and rubrics. Documents will be given out in class and also available in the main office. Each grade level in the PYP (rising K-5) will read one book over the summer and complete a small assignment, which will receive a grade. We have also included a second suggested optional title. 4th Grade Book Review Sheet Fourth grade should complete an additional small writing assignment on a separate sheet of paper and attach to the book review. MYP students (rising grades 6-8) will read two (2) books this summer; one (1) required title and one (1) title from a list provided (2 total). Each student in MYP will receive the assigned book as a gift. (Thank you, Mr. Marshall, Dr. Mason, and Dr. Pullen.) Students will be required to write an informational or persuasive essay on the assigned title and complete a creative project (some suggestions are listed) on the book chosen from the list. Both books and assignments are mandatory. Upon returning to school, students will also complete an Accelerated Reader quiz for each book. The Media Center hosts an Annual Reading Marathon! Students ask friends, neighbors, and family members to sponsor them for every minute they read during Reading Marathon week. All proceeds benefit WIA’s PTSA and the WIA Media Center. Twice a year (in fall and spring), students have the opportunity to stock their bookshelves from our terrific Book Fair selections. In 2016-17, we partnered with Scholastic and Little Shop of Stories to host our Book Fairs. For students who love to read, need a new challenge, and like a good competition, the WIA Helen Ruffin Reading Bowl team may be a perfect fit! The Reading Bowl Team is open to any student in grades 4th – 8th grades. Wesley participates in both the elementary and middle grades levels with each team consisting of 5 members and 5 alternates. The elementary team is required to read 16 titles, and the middle school team must read 20 titles. Students selected to be on the teams will need to be committed to the reading bowl and to representing WIA with honor and respect. 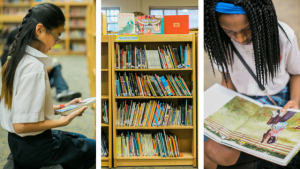 We continually looks for opportunities to bring the world of books alive at our school and to encourage the importance of reading to our students. Wesley is committed to outreach, bringing local and national authors, as well as literacy programs, to the school.